The Greensboro Children’s Museum – Not Just For Kids! Looking for fun, new activities to do with your kids? Visit the Greensboro Children’s Museum! This hands-on museum takes you through “Our Town,” a small interactive town filled with a variety of stores, gardens, a rock climbing wall, and a jungle gym, which encourage children to play in real-life town scenarios. Children can put on their own performances in the Theater, listen to their parents’ heartbeats in the Health Center, mail packages in the Post Office, and make pizza in the Pizza Parlor! Children can shop for groceries in the Market and then head over to the Construction Zone to help build a house. They can also broadcast the news, sports, and weather in the Media Room. The Children’s Museum is the first museum in the country to have a licensed Edible Schoolyard. The garden is filled with labeled fruit, vegetable, and herb plants; children will learn the various types of plants and understand where food comes from while crawling through a maze around the half acre garden. The garden also features a chicken coop with real chickens with which your children can interact. The museum’s new additions include the play plaza (“Neptune Climbers”) and outdoor picnic tables. These aren’t just for kids! The Green Acres Gala takes place at the Children’s Museum each year on May 20. The Gala is an adults only evening event with live music, tastings from the best local restaurants and breweries, and auctions. All proceeds support the Greensboro Children’s Museum programs, exhibits, and scholarships. At the event, adults enjoyed climbing to the top of the new play plaza as well! The museum is available to be rented for events. 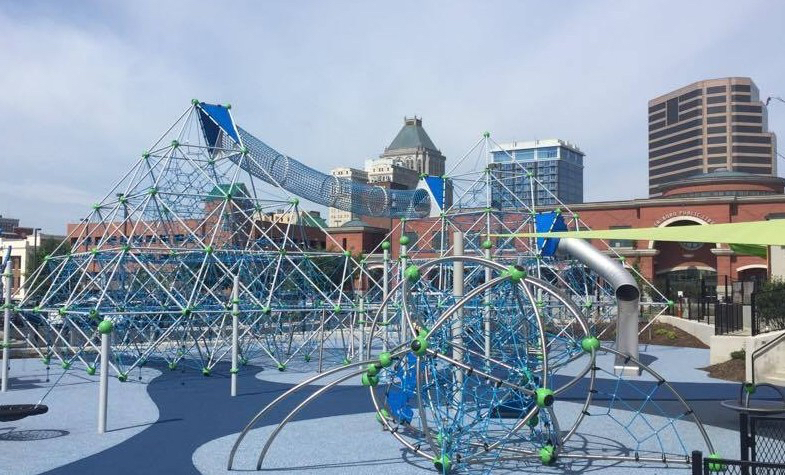 Visit the Greensboro Children’s Museum today to experience “Our Town,” climb on the play structure, and go online to register your child in summer camp! For more information, visit www.gcmuseum.com.